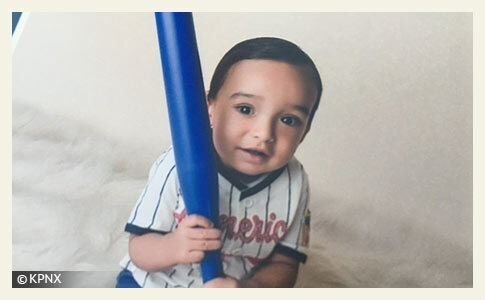 Marcos Raya, Jr., 18-months old, was attacked and killed by a family rottweiler. Phoenix, AZ - An 18-month old baby boy is dead after being attacked by a dog in south Phoenix. The attack occurred in the 1900 block of East Sunland Avenue around 1:30 pm Friday. Police report the grandmother was doing laundry when she put the baby boy down. She opened a door in the home, which allowed the dog access to the child. 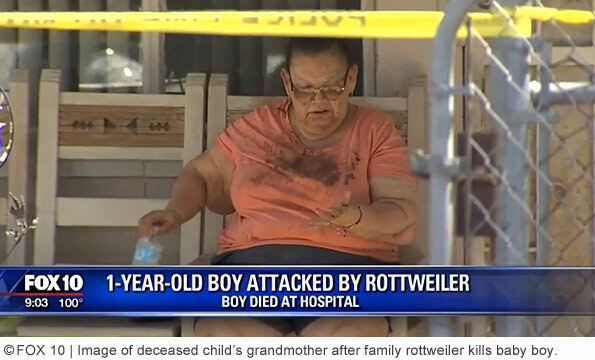 The family rottweiler grabbed the baby, dragged it outside and mauled him. The grandmother was unable to pull the dog off the baby. When Phoenix police officers arrived, they witnessed the rottweiler actively attacking the baby. An officer shot the animal, injuring it. The child was transported to a pediatric trauma hospital in "extremely critical condition," Phoenix fire spokesman Captain Rob McDade said. The baby did not survive his injuries. Fire officials said the animal belongs to the child's father and has been a family pet for three years. Maricopa County Animal Care and Control took the dog into custody. The deceased child has been identified as Marcos Raya, Jr. His grandmother called 911 after being unable to pull the large dog off the boy. "When officers arrived, they went inside and could see the dog had physical control of the child and was injuring the child," Sgt. Mercedes Fortune said. "At that moment, the sergeant fired one round at the animal and was able to divert attention from the child." He was rushed to a children's trauma center, where he was pronounced dead. "It wasn't a good scene -- It was a brutal attack by the animal," McDade said. Maricopa County Animal Care and Control (MCACC) impounded the family's rottweiler and it was euthanized Friday, according to Al Aguinaga, Field Enforcement Division Manager with MCACC. 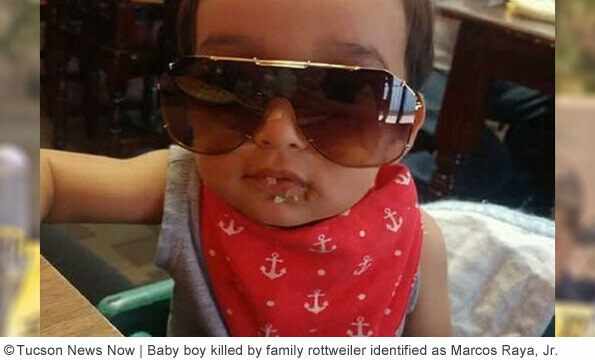 The baby boy's father had owned the male rottweiler for three years. "It's a horrible scene, and a horrible, tragic incident out here," McDade said. "It's hard when you see a child in that much trauma." Sheriff Paul Penzone has a lot of cleanup to do in the wake of Ex Sheriff Joe Arpaio. Maricopa County has suffered weak animal control policies for years. Arpaio seems to be in criminal contempt of the law in many ways. I hope justice is served for him. Remember Kevin and Mickey the pit bull, anyone? That is a sordid and awful pit bull tale. It was awful that the pit bull advocacy supported a pit bull (Mickey) that viciously mauled a child (Kevin), and left the boy with permanent injuries to be coddled in the sheriff's shelter. Arpaio officially took custody of Mickey. There used to be a Facebook page, in which pit bull advocates would 'visit' Mickey and leave supportive comments. Kevin is permanently mauled and was blamed and derided for the attack. Although Arpaio has done other terrible things than enabling the pit bull advocacy and making that 6 year old's life much harder. its that which makes me hope that justice will be served for him. What a terrible, terrible man. Maricopa isn't the only country with weak animal control. Down here in Pima County, our AC is a joke. I see online comments increasingly asserting this crazy idea that dogs are blank slates and only reflect their owners or only do what their owners trained/taught them. There's also increasingly the idea that all dogs can be rehabilitated no matter what or that aggressive actions are in response to mistreatment or a dog protecting itself. When has it ever been acceptable for a dog to maul someone because it was protecting itself or its property? These attitudes and beliefs are just insane! What is so tragic (and inexcusable of the parents) is that the grandmother — who will blame herself to her grave — had kept the dog separated from the child. But as "real life" will have it, she was doing laundry and other things and opened one of the doors, inadvertently allowing the dog to access the boy. It seems she knew she was supposed to keep the two separated but made a fatal error. How in the world can anyone raise a child in this kind of environment, much less expect grandma to be 100% perfect when she is babysitting and cleaning? It was a horrible idea to have that dog near the household at all. Then there was talk about the baby being a "miracle baby" — the mother did not believe she could get pregnant. If that was the case, who in the world would keep a massive, male rottweiler at the home? Why would one anyone ever expose a "miracle baby" to a top killing dog breed whose physical appearance clearly states: "Built for aggression will harm"? This was a vicious predatory attack — snatching the baby behind the grandmother's back, dragging it outside then repeatedly attacking it. The dog was still attacking the baby when police arrived. The poor grandmother witnessed it all too. She may not survive by literally dying of a broken heart. The baby's parents will have the rest of their lives to consider why having a "miracle baby" and a monster living in close proximity was a terribly cruel idea. I can't imagine what that poor woman is going through right now. Probably a grandmother like so many grandparents these days 'recruited' into babysitting, but in this house there was the added stress of trying to keep a toddler away from a dangerous animal. She tried. She failed. But it was the father who chose to keep the animal after his son was born; he owns the bulk of the blame. It is only a miracle that a neighbor's child wasn't killed by this dog. The entire neighborhood is at risk when people have breeds of dog that exist because Man intentionally created them and selectively bred them to be violent. The little guy didn't have a chance. Neither did the grandmother against that dog. The fault in this situation rest squarely on the parents/baby daddy for having this dog at all. Its impossible for a human being to be perfect and never to make a mistake. Poor grandmother who now will blame herself for life, even though it was inevitable that at some point someone would leave a door open or let the dog get near the baby by mistake. The dog should have been rehomed when the baby arrived. They clearly knew the dog had the capability and temperament to attack their baby (they were keeping them separate with closed doors between them). I wouldn't trust a predatory breed around small children either, even if the dog is normally well socialized with people, very small children or babies can look like prey to them (which is why there's quite a few husky attacks on babies and young children even though huskies usually have a stable and friendly temperament towards adult humans). What a beautiful little boy. How absolutely awful and heartbreaking. The photo of the grandmother with her grandbaby's blood on her is disturbing and gut wrenching. I can't even imagine how she must feel. My sister-in-law has a male Rottweiler who I absolutely do not like. He's not allowed near my children when we visit them – which isn't often because they live 5 states away. I understand why the grandmother kept that dog away from her grandson. I feel the same way about my SIL's dog. When we lived in CO, we had neighbors who shared a fence with us. They had 2 kids and 2 pit bulls. In a very similar scenario, when the grandmother babysat, she kept the dogs separate from the kids. The father told me his mom didn't trust the dogs and kept them away from his kids. I feel terrible for grandparents who are in the same boat as this grandmother was. She was trying to protect that beautiful little boy by keeping the dog away from him. A simple mistake led to a baby's death. It's so disproportionate. Leaving a door open in any other case (non fighting breeds) leads to perhaps a counter surfer or a bed jumper (my dog) – but those simple human mistakes with the powerful fighting breeds can lead to death. I will never understand what makes the risk worth it to some parents – especially if this baby was a miracle baby. It's so,so sad. I pray the grandmother can find some peace one day. Her heartache must be unbearable right now. I have three children, and didn't realize till recently how over the last 12 years, dog attack deaths have become horribly common. Ppl who love dogs or animals more than humans is frightening. When will this stop. How many of God's beautiful young children like this will suffer. Its about using wisdom. And the wise choice is to ban these breeds and stop the cycle of death. This child could have been our next president, his life was robbed from him and the animal hippie lovers will say its not the dogs fault a d shouldn't be put down. Sad mad world. My heart goes out to the family of this miracle baby.